Gesture controlling is a new technology that has been deployed in some of android smart phones. Some of them have been launched whereas some of them are under development. Gesture controlled cell are very expensive and almost out of the reach of many android lover. People love to use gesture controlling that makes smart phones an intelligent device but being expensive, many people cannot afford them. However, there is good news for those people as there are lots of apps launched for android that can make their device gesture controlling device. You do not have to pay much for these apps. Here are the top 5 gesture controlling apps that can make your android device super intelligent. Number 1 spot has won by xposed gesture navigation for android. Controlling your android device has never been so easier before. This app lets you use multi-gestures to perform different tasks. You can open any application with multi-gestures, navigate to home screen, main menu, lock the screen, control music player. You can also turn the torch on/off, take screen shots, kill apps and lots more. SwipePad is a simple, smart and fastest app to launch multiple apps with a single gesture. The SwipePad can hold on mix of apps, bookmarks, shortcuts, contact, etc. Moreover, it is battery friendly and light weight (consumes less memory). The app also allows you to set direct call phone numbers as well. The app has the rating of 4.5. Number 3 gesture controlling app for android according to my list is SideControl. You can speed up your phone handling and customize the app easily to open apps, navigate through home screen and main menu, open last notifications, sidebar recent apps, control music player, kill apps, manage calendar, toggle Wi-Fi and Bluetooth, etc. the app has current rating of 4.2 and people are loving this app. Another great app with lots of great features, Automaton Locker allows you to handle locking and unlocking of your device using simple gestures. The saves the battery and lock key usage from damaging by instantly locking the device. However, the app would be great if it’s completely free. The app is free for 31 days and you have to buy Automaton Unlocker after that to work with Automaton Locker. 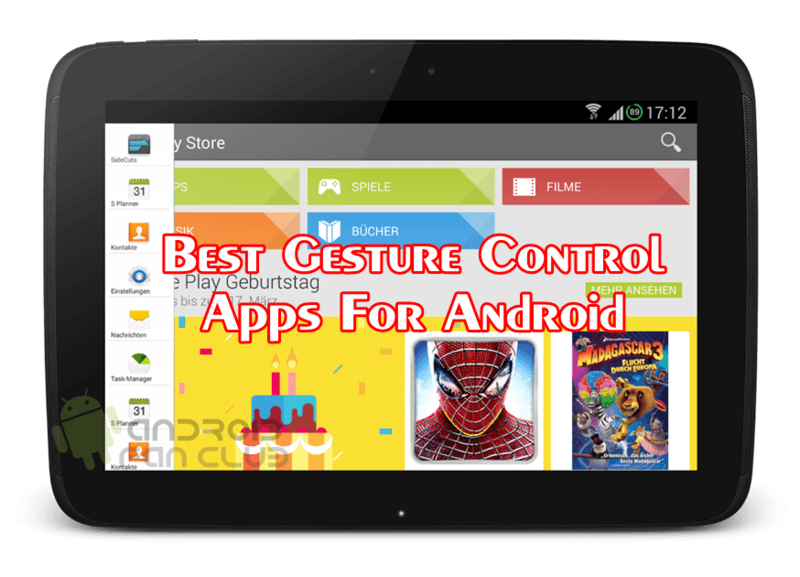 The app has the current rating of 4.1 and is number 4 on our list of top 5 gesture controlling apps for android. The app gives you the ability to quickly and effortlessly answer or reject calls with just gestures. The app can be immensely useful especially when you are driving or doing work in kitchen and your hands aren’t free to pick the cell phone. You can just answer or reject the call with gestures. You can even on/off the speaker or text after rejecting the call. These apps are great and intelligent to control your cell phones without even touching. Try them and do give reviews about what you think of these apps.